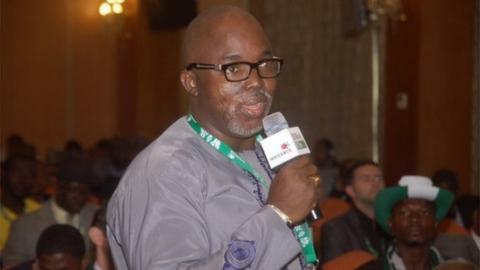 The Nigeria Football Federation (NFF) has elected Amaju Pinnick as its new president after a vote on Tuesday. The 43-year-old Pinnick, who is is Delta State Sports Commission chairman and Delta FA boss secured 32 votes from the 44 available in a second round of voting. Rivals Dominic Iorfa received eight votes and Taiwo Ogunjobi received four. However, the man who was believed to be the front-runner for the job, Shehu Dikko, withdrew his candidacy. Several problems arose in the build-up to the polls, with reports that the electoral chief Samson Ebomhe had been arrested by officers from Nigeria's main intelligence agency, the Department of State Services (DSS). Ebomhe said on Wednesday that he had not been detained and was just unavailable, although he did not explain why. The high-profile election was a battle between old heads Amanze Uchegbulam, Taiwo Ogunjobi, Mike Umeh, Dominic Iorfa and newcomers Shehu Dikko, Amaju Pinnick and Abba Yola. But businessman Dikko, who helped arrange a tour of Nigeria for Manchester United in 2008 and has brokered several tie-ups with the English Premier League and the domestic league, pulled out of the race, according to the electoral committee. The polls went ahead despite a court injunction barring it from taking place and incumbent NFF president Aminu Maigari, his general secretary Musa Amadu and the sports minister Tamuno Danagogo are expected in court on 8 October. An injunction was purportedly granted to a group led by self-acclaimed NFF president Chris Giwa. The group has twice been turned back by the Court of Arbitration for Sports (CAS) in recent weeks. A petition challenging the validity of the NFF general assembly was last week upheld by a Jos high court which then issued an injunction against the elections. The elections went ahead nonetheless and thrust Pinnick into one of the hottest seats in African sport. Pinnick said: "The plan is to make genuine reconciliatory moves. I will personally go to Jos to see and speak to Chris Giwa because we all need to come together for the sake of our country and football. "I have already received calls from top corporate directors saying they will support us just by the names on the new NFF board, a clear indication that there is light and positivity ahead." Also on Tuesday, Seyi Akinwumi was named as the first vice-chairman, while Christopher Green, Suleiman Yahaya-Kwande, Ahmed Yusuf, Felix Anyansi-Agwu, Dele Ajayi, Sharif Rabiu Inuwa, Modibo Hassaini and Kachalla Baba Gana were all appointed to the NFF board. Musa Ibrahim Gusau was unopposed as Chairman of Chairmen, the head of Zamfara state FA, will represent his colleagues on the board. The tenure of the new NFF board will expire in 2018.